Last night while watching So You Think You Can Dance with all the kids the new Saskatchewan Roughrider commercial came on and I just about jumped out of bed when I saw my Dad, Grandpa Ed and Uncle Wayne in the commercial! 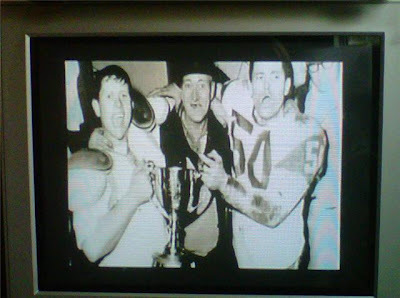 It is such a moment of joy in the dressing room after winning the 1966 Grey Cup. Can you imaging being my Grandpa Ed and watching not one but two of your sons become Grey Cup Champions. The picture says it all. I was so proud to see that image. And for the kids they never had a chance to meet Grandpa Cliff. Kelsey was saying look Carson that's our Grandpa that's Mom's Dad! I never had a chance to meet either of my Grandpas so I know how they feel and this is a way of knowing a bit about my Dad. Next month is 17 years that my Dad has been gone. But thankfully I have plenty of awesome memories of him. And this is another way his legacy lives on.